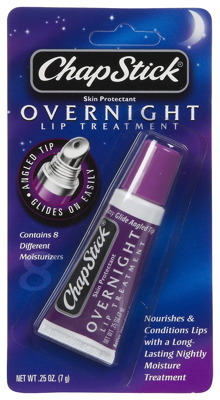 Chapstick Overnight was designed to be taken at bedtime and it’s product use was described as: “Nourishes and conditions lips with a long lasting nightly moisture treatment. Contains 8 different moisturizers - glides on easily/angled tip. Helps prevent and temporarily protects chafed, chapped or crackedlips and helps moisturize and condition while sleeping.” Yet another attempt by the Balm companies to keep your lips held hostage by their products now 24 hours a day. As for Dimethicone, it is described as having side effects such as “burning, stinging, redness, or irritation may occur. If any of these effects persist or worsen, tell your doctor or pharmacist promptly.” So, while in theory this product has been declared “safe” you may still need to see a doctor. Doesn’t sound like a harmless ingredient. It does appear that this product has been discontinued. A post by ChapStick on Facebook back in June 2013 indicated the product was still available. But it is no longer listed on the ChapStick website. Perhaps the product didn’t sell. Or perhaps our side won a small battle against the Balm companies who will not be satisfied until every single person is using regularly. I’m definitely addicted to Chapstick, but my problem is I don’t want to stop. If I don’t use it, I become extremely uncomfortable and can’t think about anything else. I make sure I always have it on me. But it bothers me that I’m like this, and I worry about what it would be like if there were some kind of event that turned our world upside down… e.g. zombie apocalypse, WW3, massive electricity outages… anything that disrupts distribution and availability of goods. I would suffer. There’s something wrong with that. It will take more to actually drive me to the point of wanting to quit, but I’m glad you have this site so I can see that I’m not alone in this and that it is a serious issue for others. Bring back the Overnight lip saver!!!!! I will purchase a case! I love it!! My mother loves it! My sister loves it! Please bring it back! Only thing that really works and is not greasy and no taste to upset you! Would love to know where i can purchase chapstick overnight. I’m almost out of my last tube of this and I have been looking everywhere!! Does anyone know if it is actually discontinued? I would like fot the overnight chap stick to come back.Where can I purchase it ? Denise, we do not help people continue their addictions. Sorry. Yeah… um this is not an addiction. Even if you fail to see that it’s not an addiction, you need to treat it as the minor inconvenience that it is. This is nothing of importance. If your life is so trouble-free that you have the energy to give to this, then congrats: you live a very happy, semi-delusional life. This website is the essence of first world problems. An actual moisturizing lip treatment, if it would exist, which it doesn’t, would prevent lip balm addiction by causing people to not have dry lips in the first place, so they wouldn’t even start. A working lip treatment can actually prevent addiction. It is not an addiction… used this product only when lips were extremely chapped by wind, cold etc.. healed them usually overnight, much faster than ordinary chapstick products. Never used it more than two nights in a row! and certainly wasn’t addicted. Too bad other people fantasies about “harmful” side effects have to impact those who have no side effects at all! If you didn’t like it, don’t use it, don’t nanny me and tell me what I can and can’t use! First of all,some of us are on medications that dry everything out. Have tried many of the products now available and all that happens is that instead of being red and irritatef, my lips crack and peel. The lip balm that Chapstick seems to have discontinued is the only thing that didn’t cause that to happen. As far as addiction is concerned..it is not an addiction if one only uses it once or twice a month..when needed. It is ridiculous to have necessary products taken off the market because some idiot thins he/she knows what is best for everyone. Fed up with this crap! Chapstick Overnight is still available in Australia to anyone looking for it. get rid of it. I took it to the stores to show them but no one can come up with it again.